No one writes scary concept albums like King Diamond - no one. This disc is one of the spookiest lyrical excursions you will ever encounter. 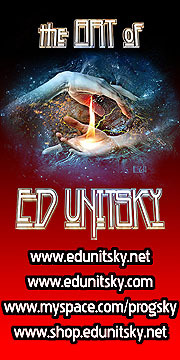 Musically it is hard-edged metal with very powerful musicianship and progish arrangements. The main stumbling block to enjoying this is King himself. His vocal style certainly takes some getting used to. The man has an incredible range, jumping from deep guttural work straight into high soaring vocal lines in the course of one measure. He also gets very creepy and death metalish. (death metalish? doesn't quite make sense) Once you get used to his voice, it is potent and entertaining, but definitely an acquired taste. This reissue includes all of the tracks originally on this concept album with the addition of four bonus tracks. Three of these bonus tracks are simply "rough" mixes of songs already on the CD. Spooky sound effects with a processed spoken funerary speech. It describes the acts necessary to keep Abigail dead in her coffin. The voice gets more distorted as it carries on. Haunting sounds followed by a neo-classical build up end the piece. Hard edged and fast metal with rapid changes makes up this cut. 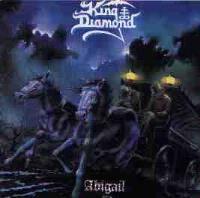 It features the vocal insanity of King Diamond. It has a lot of changes in its progression. The track tells the tale of a man who inherited an old mansion being warned of the house and ignoring. Starting in a great prog-metal progression, this cut is fast and furious. It also has a very strong hook. Taking possession of the home, we learn, but Jonathan, the owner does not, that it is not uninhabited. "Both were fast asleep before dawn, Dreaming...Dreaming, And they did not know about the shadow, Yeah, the shadow on the wall, It really came alive." More fast-paced and quirky metal, this one continues the story in quite spooky fashion and features an awesome melodic solo. Jonathan is visited by the ghost of the former owner of the house, his ancestor. The spirit leads him to the crypt below the mansion and shows him a sarcophagus of a child, explaining that it is Abigail, who was stillborn. Next comes Jonathan's second warning, "The spirit of Abigail is inside your wife, And there's only one way you can stop the rebirth of evil itself, You must take her life now." Beautifully haunting acoustic guitar modes with keyboard strings begin this cut and slowly build. As the intro ends, hard-edged furious metal takes over. This one tells of how Abigail came to be stillborn, and it was certainly a skeleton in her father's closet. This track really rocks. Another hard-edged number, this track is based on a killer riff. It touches on weird, paranormal omens that continue the tale. "Nobody's inside the church but the bell is ringing, For no reason the flowers are dying." This one has a great neo-classical keyboard solo, and the guitar solo is in a similar mode. More fast and frantic metal, this features an awesome melodic bridge with very progish elements. It deals with the wife Miriam's possession by Abigail. This is a very dramatic piece. More hard-edged metal with almost neo-classical textures, this one continues the story with Jonathan's realization that he must kill his wife to stop the evil. The song has a great horror film sounding keyboard-dominated outro. Acoustic lines a bit in the mode of early Rush start this track. The cut begins building from there, in a great classically tinged acoustic style. The first verse of the song is in this format. The remainder of the composition is in a solid, tasteful and intriguing metal mode. The lyrics bring the story to its conclusion, which is actually where we came in. This is a fast paced, hard-edged rocker. It features some killer guitar work and a great texture to the later parts of the cut. This is just a rougher mix of the earlier cut, still quite polished, though. This is a different version of the track, focusing on the harder edged mode. It has a very strange spooky section. This version is incredibly fast-paced and powerful.